What a difference a week makes. This time last week (and the week before that, and the week before that…) I was seriously struggling with my mojo. I didn’t feel like working out. I didn’t care if I ate crappy. And in large quantities. None of it mattered. If you read yesterday’s post, you know it was in part because I had allowed myself to be completely overwhelmed with life. I had just really taken on more than I could handle and the only person I had to blame for that was myself. I now feel like a huge weight has been lifted off my shoulders by just letting go of the pressure I put on myself to be everybody’s everything. I’ve worked out for the last 3 days in a row. I’ve been sore the past two days. (Gosh how I missed that feeling.) I’ve eaten reasonably. And I’ve realized the only expectations for perfection come from myself, not anyone else. I realize by only posting positive, happy, (hopefully) motivational stuff, I’m presenting an inaccurate picture of myself. One that might seem unrelatable. Well believe me, I’m relatable (sometimes more than I’d care to admit). I struggle with the same things many of you do. On the other hand, I love to research fitness and nutrition stuff and enjoy posting about it or writing posts of motivation when the idea hits me. So if you’re a regular reader, prepare yourself because it’s about to get real up in here. If you’re new to my blog. Welcome. My message for today is no one has magic mojo. We all work for it and we all struggle with it. But when the mojo hits, it’s definitely MAGIC! 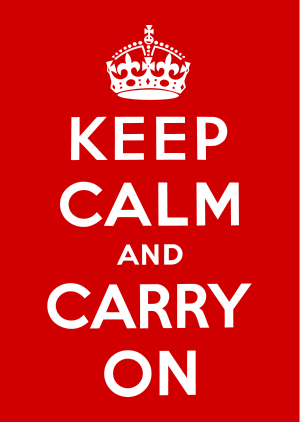 So, keep calm and carry on. This entry was posted in Body Image, Finding Balance, Fitness as a Priority and tagged balance, chaos, Family, fitness, Mojo, Motivation. Bookmark the permalink.